While many of the smaller species (e.g., Porphyrolaema) are solitary, the larger species (e.g., Gymnodoerus) will often travel in small flocks. 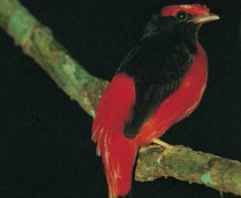 There are general "tradeoffs" in adaptations used by male cotingas to attract females. In general terms, males of the smaller species (e.g., Cotinga) tend to be brighter colored and less vocal, whereas the medium-sized species tend to be more vocal and less brightly colored (Querula); the largest species (e.g., Cephalopterus) tend to have more apparent body ornamentation, such as throat wattles or lappets. While many of the cotingas have a very subtle or soft call, some of the more "drab" species compensate what they lack in plumage with a series of resonating, and sometimes far-reaching, whistles (e.g., Lipaugus, Tijuca, Querula). Some of the larger species are able to expand parts of the trachea and pharynx, to release with the exhale a sound similar to the "mooing" of a cow, thus the name "Calfbird" (Perissocephalus); another species displaying this "mooing" vocalization is the Umbrellabird (Cephalopterus). Other species (e.g., Rupicola, Procnias nudicollis) are quite vocal as well. Some species are able to produce noises of sorts with their wings (e.g., Cotinga, Xipholena, Phoenicircus, Rupicola). Many cotinga species form "leks" (loose to tight associations of several males vying for females through elaborate display), although this trend appears to be strongest in the medium-sized species (e.g., Lipaugus, Phoenicircus). Cotingas do not exhibit any great degree of territoriality. For example, different species of cotingas (e.g., Cotinga, Querula, Gymnodoerus) may be perched in the same tree with no agonistic behavior. 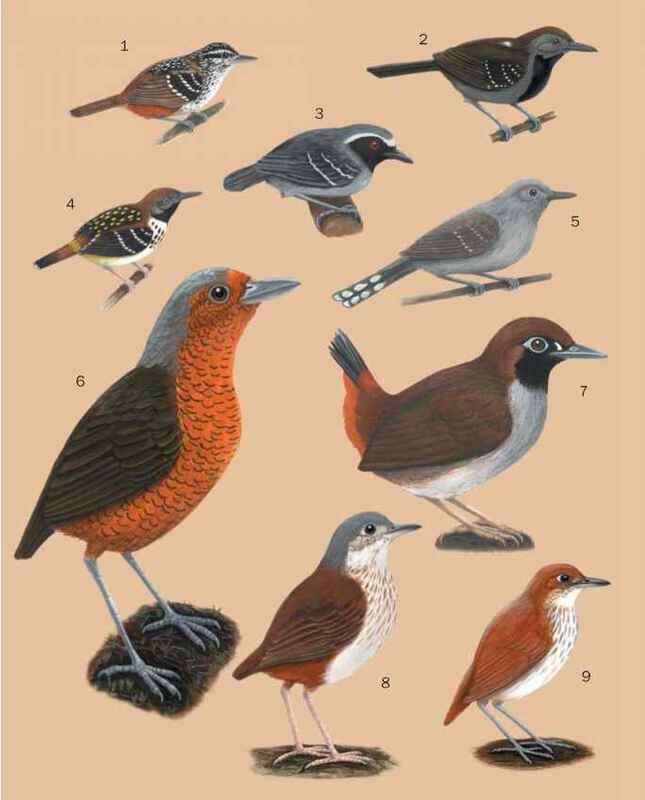 Similarly, these same species have been observed occupying trees with other families of birds (e.g., kites [Ictinia plumbea], parrots [Graydidascalus brachyurus, Bro-togeris cyanoptera], flycatchers [Empidonomus aurantioatrocrista-tus, Tyrannopsis luteiventris], and other passerines [Laniocerca hypopyrrha, Scaphidura oryzivora, Thraupis episcopus]) present without incident. Helmut Sick notes that species such as Piprites, Querula purpurata, and Oxyruncus cristatus join mixed species flocks of birds regularly. During more than 10 weeks of observation in the northern Peruvian Amazon, only a single incident of agonistic behavior was observed. This involved a female spangled cotinga Cotinga cayana and female Cinereous mourner Laniocerca hypopyrrha (a non-Cotingid) simultaneously mobbing a female bare-necked fruitcrow Gymnodoerus through habitat that was atypical for the latter species. The mobbing behavior led to the Gymnodoerus flying out of the area. In Brazil, Sick noted a Procnias nudicollis displacing a female Xipholena atropurpurea from a tree. Like most Passerines, cotingas are inactive at night, and most active during the early morning light. The secondary peak of activity tends to occur in the late afternoon, just before dusk. Although some short-distance migration patterns (or alti-tudinal migration) may characterize some species of cotingas, the family is for the most part non-migratory.